Are you a serious gamer that still is looking for a reputable gaming headset? Are you also still hyped after seeing Thor: The Dark World? 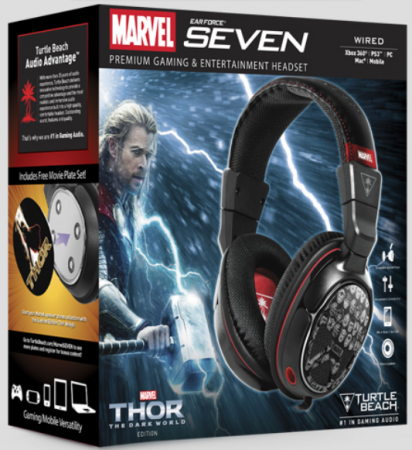 Well, what if Turtle Beach launched a Thor: The Dark World inspired headset with their latest Earforce SEVEN line equipped with an in-line amplifier? What if I stopped asking questions as an intro!? Turtle Beach is a frontrunner in gaming audio solutions and their SEVEN series of headsets holds no punches with its Professional Tournament Grade Sound. 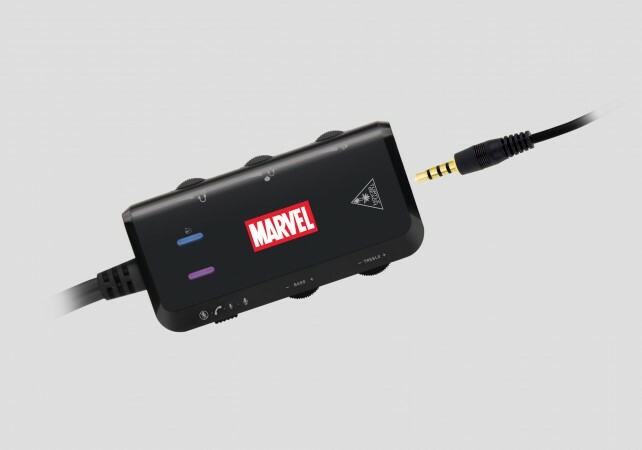 Alongside the launch of the latest Marvel movie, Turtle Beach released a multi-platform headset that endeavors to quench any gamers thirst for high-quality sound, no matter which direction they are looking. When looking at an “inspired” headset, the appearance is what soaks up the bulk of the inspiration. Here you have a standard SEVEN series model with the Thor-esque color palette. 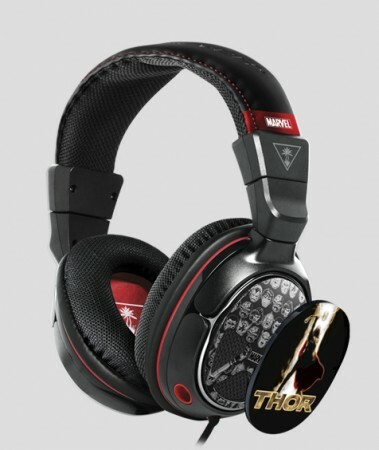 You have Marvel’s logo on each side, some “Marvel”-red stitching and red padding on the inside of the ear cups. Turtle Beach takes advantage of the much-advertised customizability of the headset’s speaker plates. The headset comes with Thor speaker plates for you to slap onto the sides of your headset. (Warning, Thor speaker plates do not grant you the power to lift hammers that others cannot. ) Furthermore, those speakers aren’t just for show as those ear cups house premium 50mm drivers that rest comfortably on your head thanks to soft memory foam cushions. But in case you still want to show off, you can do so easily since the ear cups rotate to allow you to wear the unit around your neck. The headset is supported on a wide variety of platforms. Confirmed platforms include: Xbox 360, PS3, PS4, PC, Mac, and mobile devices. Connectivity for each was executed well with any connectivity nuances thoroughly considered. The boom mic is removable, allowing for proper transition between console, PC, and mobile use. With the in-line amp control, you can tweak treble and bass on the fly, separately manage game and chat volumes, adjust the volume of your own voice to avoid shouting, and toggle the mic between mute, in-game, or phone call mode. I found the phone call mode to be particularly interesting. You can connect your phone to the amp and hear your own music during gameplay. Should someone call you, switch your mic mode, answer the call, and now you are using the headset to casually have your phone conversation without breaking away from the game. The in-line amp has everything you need to manage every gaming scenario. Not to mention that the cable housing the amplifier is VERY long – ready to navigate almost any console or computer scenario. Having seen many multi-platform headsets, one factor that was always hit or miss was how they handled use for mobile devices. Some headsets actually expected you to roam around with a 10 foot long (plus) cable connecting to your handheld game or mobile device. Sure, they came with cord-wraps. But who walks around with a spool of wiring? As mentioned before, the boom mic detaches. ; however, so does the epically long in-line amp cable! You can replace it with the included, reasonably-sized mobile adapter cable which includes a multi-purpose button for answering calls on your phone, or controlling your music player. I find myself leaving the commanding sound quality for the end because Turtle Beach seems to never drop the ball on this front. The sound is beautiful coming in as it is going out. The unit uses USB to power the unit which allows for two scenarios worth mentioning. 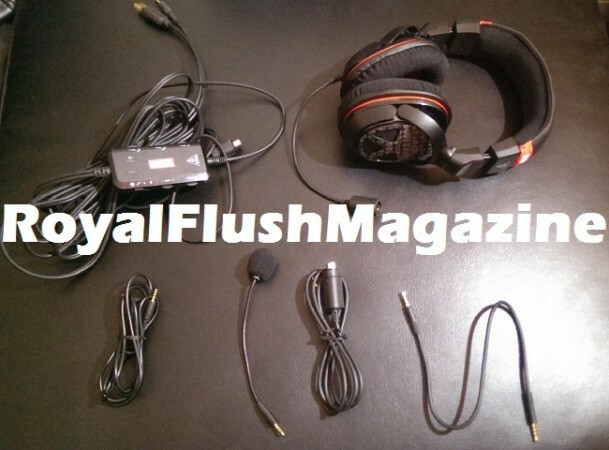 Should you have a PC with a respectable sound card that you do not want to bypass, the headset’s instruction manual shows you how to ensure that your machine is driving the sound and not the headset. But should you be using a machine that is not blessed with such sound-powering internals, you can allow the headset to take over and work solely as a USB headset. In either event, the headset will install its own drivers the first time you plug in the USB on a PC. High quality Turtle Beach sound coupled with every conceivable listening scenario thoroughly hashed out. At $199, this is the headset to buy for any gamer. You’ll only gain additional points if the lucky owner is a fan of Thor. If not, which would be shocking, they are always free to browse the Turtle Beach library of speaker plates and plop in new ones closer to their liking. Want to buy your own? Go to their site and check it out for yourself! Wires! More than any budding electrician could ever want… Maybe! † Some images taken from Turtle Beach product page.